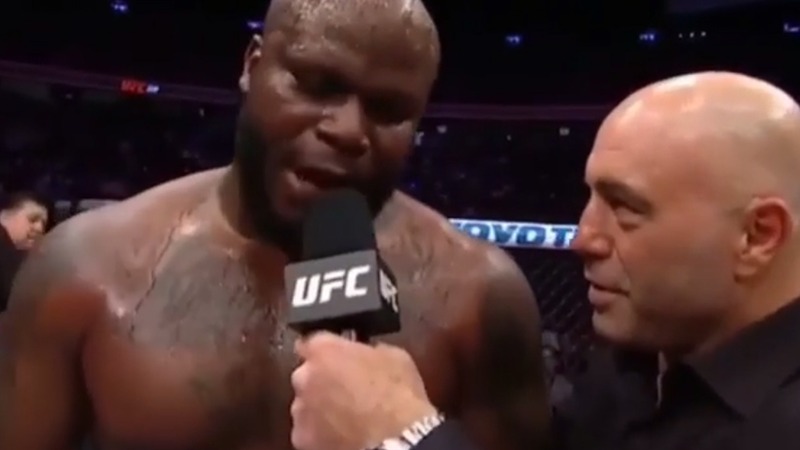 Derrick Lewis is a funny personality and a knockout power in the UFC. Both traits were on display last night in his sensational knockout victory over Alexander Volkov at UFC 229 from T-Mobile arena Las Vegas. With time was running out on the clock, Lewis makes a comeback by crushing Volkov with a brutal counter right hand that dropped him. Lewis quickly ground and pound that forced referee to stop the action at 4:49 of round 3. Lewis twice overcame clear eye pokes and showed tremendous heart and chin to rally back for the exciting win. Let’s get right here after the win Lewis took off his shorts just before UFC commentator Joe Rogan went inside the Octagon to interview him. As they were discussing the fight, Lewis said he’d receive a call from President Donald Trump. “A couple of hours before the fight, Trump called me and told me to knock this [expletive] out and make him look bad,” Lewis said. A victory put “Black Beast” into a prime position for a heavyweight title shot, but Lewis is in no rush for the challenge, a title which is currently held by Daniel Cormier. The end of the night was fucked up, but I choose to think about this moment when I remember this event. That, and all the other great fights. Even the main event was awesome up until the disaster after the tap. Either way, @thebeastufc had the best post fight interview ever, and he’s got the best Instagram page out of any fighter in the sport. The end of the night was fucked up, but I choose to think about this moment when I remember this event. That, and all the other great fights. Even the main event was awesome up until the disaster after the tap. Either way, @thebeastufc had the best post fight interview ever, and he’s got the best Instagram page out of any fighter in the sport. That was some fun stuff from Derrick Lewis, who never change lol.